I think a sweet recipe was long overdue round here. Don’t assume that the relative absence of dessert recipes on this blog is a sign that I’m not fond of sweet things – you’d be very much mistaken. It’s just that I live in a house with one other person and I really can’t bear to throw food away (and nor should I!). And I really do like sweet things so if they are lying around the house, I will eat them. But! Life needs balance and so does this blog. My husband suggested that I should make a muffin recipe using sweet potatoes. 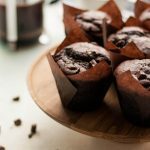 Three attempts later, this double chocolate sweet potato muffin recipe was born! Of course, with the mass amounts of chocolate I managed to squeeze into these muffins, you can’t really taste the sweet potato. 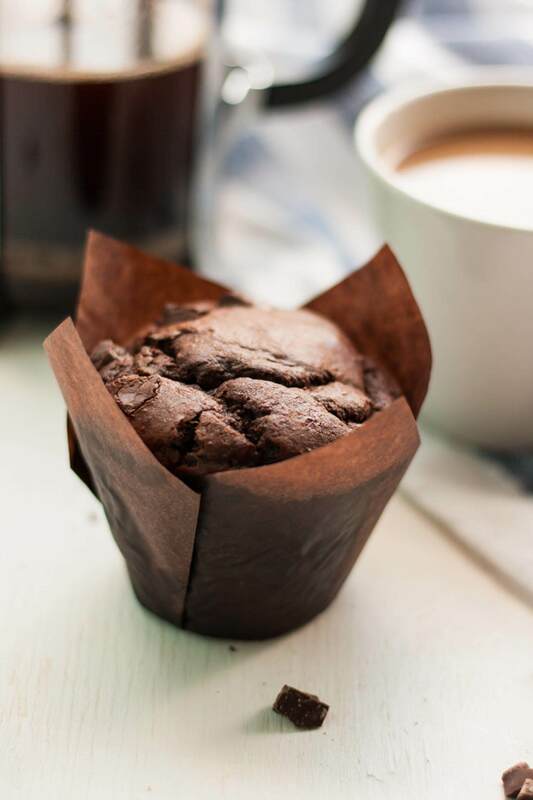 But it lends a subtle sweetness and results in a seriously moist muffin. Especially when they first come out of the oven and you eat them whilst they’re still warm and there are rivers of melted chocolate inside. Oh yes, these are good! You know when you go to coffee shops and they have those huge muffins in tulip cases with the puffy tops? These are like that! I have never managed to make them like that until now. 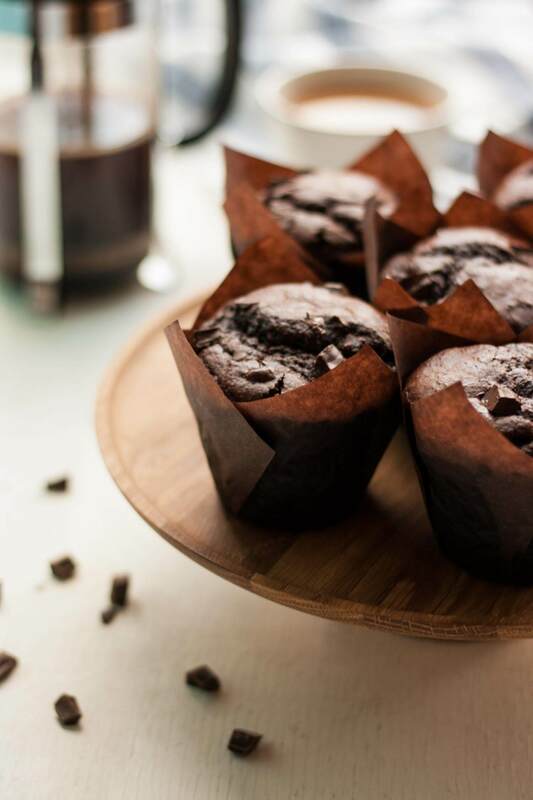 I mean, I wouldn’t exactly recommend that you make your muffins that size, but I’m not going to dissuade you either… But those muffins in the picture? They were some big muffins. Anyway, let’s just say that these double chocolate sweet potato muffins have been rigorously tested. And they are super awesome and you should pick up the ingredients for them on your way home from work/school/wherever or hey, make a special trip solely for that purpose. Just do it! Almost. I mean come on, they have a vegetable in them! And spelt flour. And way less sugar than lots of traditional muffin recipes. If you’re going to have something sweet, they might as well be these, right? And of course there are no excuses NOT to make them either – these are so easy to make. Bake a sweet potato whilst you have the oven on for dinner and then you’re only a few short steps away from amazing dessert territory. You don’t even need any special equipment, how’s about that? Preheat the oven to 180ºC (350ºF). Line muffin tins with muffin cases. Start by melting together the 70% dark chocolate and the butter. I find it easiest to do this by placing the chocolate and butter in a heatproof bowl set over a pan of simmering water. Ensure the water does not touch the bowl and stir occasionally until melted. Remove from the heat. In a large bowl add the mashed sweet potato and pour over the melted chocolate and butter. Using a balloon whisk (or a wooden spoon) mix together well. Add in the eggs, one at a time, mixing well after each one. Next incorporate the milk, sugar, vanilla and salt - the mixture should be smooth and runny. Switch to a wooden spoon or spatula and gently fold in the flours, cocoa powder, baking powder, bicarb and chocolate chunks. Divide the mixture between the holes of your muffin tin - when I made this recipe using regular muffin cases I got 15 muffins. Bake for about 20 minutes - they are ready when a skewer inserted into the centre of the muffin comes out clean. The recipe makes about 15 regular sized muffins. When I made this recipe to take photos I filled those huge tulip muffin cases really full and got 10 muffins. 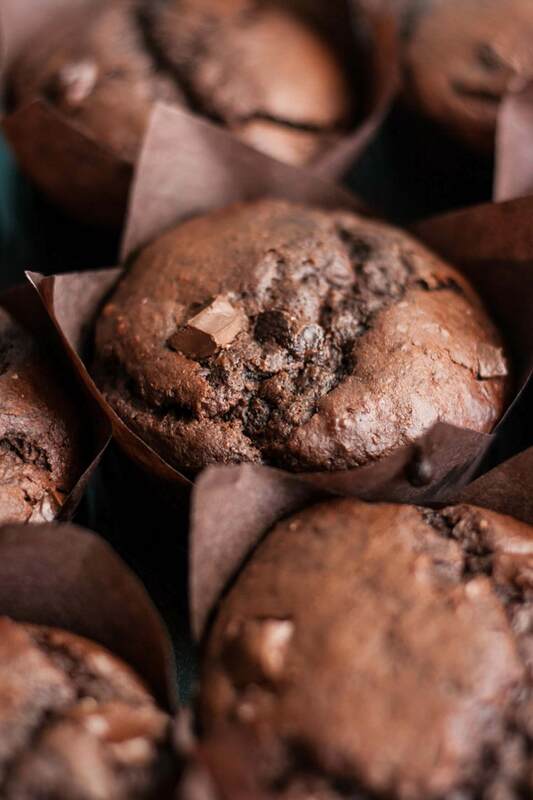 If you want to make mega muffins, you'll need to bake for around 25 minutes. 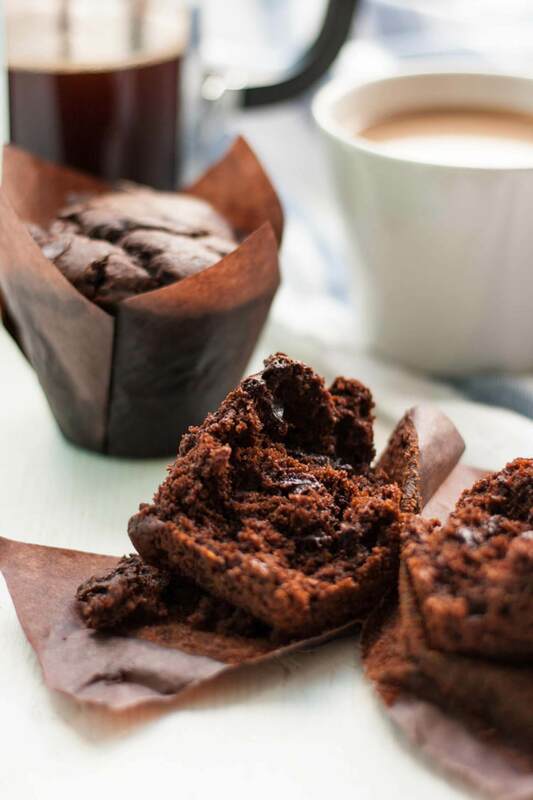 These muffins are seriously chocolatey and not super sweet - if you prefer a less intense flavour then I recommend you substitute 70% dark chocolate for something with around 50% cocoa solids and replace the cocoa powder with the same amount of flour. Use any kind of milk you like - I have used both cow's milk and almond milk to good effect. They look great Sasha. As a chocoholic I’m a big fan of these! Thanks Debs! They certainly satisfy my monster chocolate cravings haha! These muffins look soooo good! Anything that has chocolate in it and is suitable for breakfast is calling my name! Thank you Bethany! They’re good for any time of day! Goodness these look absolutely amazing! 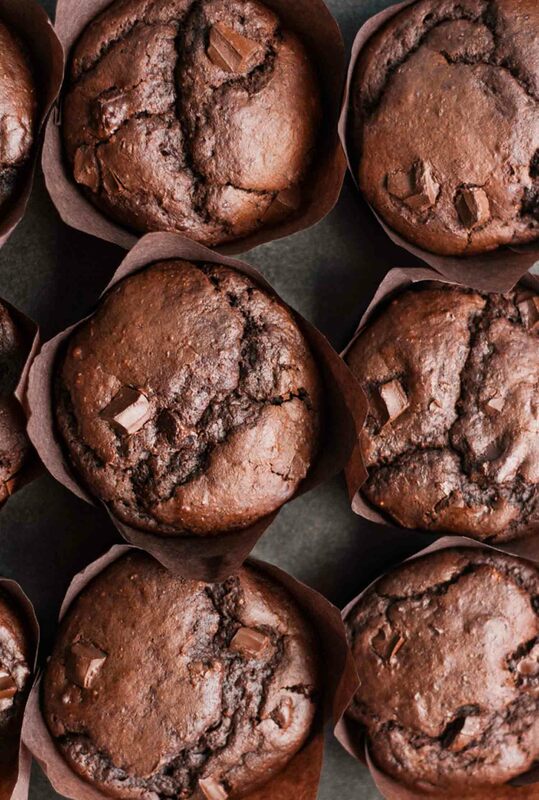 Chocolate + sweet potato… a brilliant combination. Mmm these look yummy! I love both chocolate and sweet potato but I have never had the two together. Would love to try making them. These look decadent and yes I would say they are healthy! 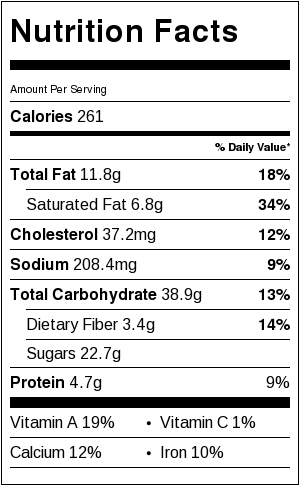 I’ll bet the sweet potatoes make them extra moist. Love your cute wrappers too! I can’t get over this sweet potato in a muffin thing. I’ve never tried it but I really think I should! The description sounds delish. Almost healthy is the way to go! Almost healthy is definitely the way to go – but trust me, they taste seriously indulgent! I really hope you do try them!